Several years back, with the advent of speech recognition of technology (Dragon), the medical transcription industry was forecast by many to see a reduction in demand. That has not turned out to be true, as medical transcription industry revenues continue to grow each year. Now with the Obama administration pumping in money in healthcare by incentivizing Physicians implementing certified EHRs and demonstrating meaningful use, many EMR vendors are again proclaiming the demise of Medical Transcription stating that after implementation of EMR / EHR Software, the Physicians can eliminate use of Medical Transcription services altogether. While I agree that the role and nature of medical transcription will change in the new world, I do not believe that physicians and clinics can stop using medical transcription services altogether. EMR solutions are based on point and click templates and capture data as discrete data elements. However, to any one intimately familiar with the nature of dictations and transcripts, it is obvious that there is a narrative part of the medical note which tells what the doctor is thinking during the patient encounter. How will this narrative be captured as part of eletronic medical records? It has been shown that such narrative contributes to a detailed electronic medical record and supports meaningful use of the EHR. The narrative can either be produced in real-time using speech recognition software like Dragon, or it can be produced on the back end using traditional digital medical transcription services and input into the EHR by the transcription editors. In a survey carried out, over 75% of the respondents indicated that they are interested in productivity aids that would help doctors to better document care within an EMR (beyond the standard point and click). Even though the accuracy of speech recognition software has improved significantly and it can be trained, most physicians find it a distraction - imagine the physician seeing the software wrongly transcribing and repeatedly interrupting his dictation to correct the transcript using keyboard and mouse - and do not want to take on the editing responsibilities. Speed of charting has been one of the main sticking point with the physicians who complain that the EMR slows them down. 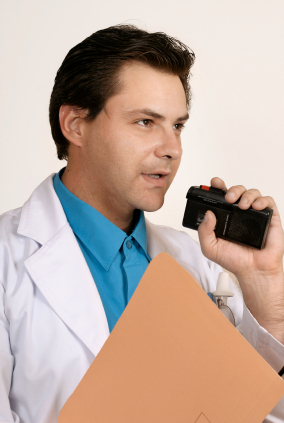 Dictation is still the preferred method for physicians to document encounter notes. A possible solution that partly alleviates the concern of the physicians is to have the Medical Transcription Company introduce XML tags (in a semi-automatic manner), make the data elements ready for abstraction and then load the same into the EMR Software's database as discrete data elements. I would like to get feedback from readers if they have seen this technology solution successfully deployed. According to Jay Cannon, EHR vendors need to work closely with the Medical Transcription service providers to deliver "hybrid clinical documentation solutions" that give physicians flexible choices for input, along with discrete, reportable data output for the EHR. I completely support this philosophy. Our recommendation would be for prospective EMR customers to ensure that the EMR Software allows for an easy and unobtrusive interface for the provider to dictate and for the Medical Transcription Company to come in and transcribe right into the EMR or load final and structured documents into the EMR. Do let us know of your comments and / or experience with implementing such a solution successfully. If you like getting such insights into the world of EMR / EHR, please subscribe to our regular updates by Email or RSS feed.